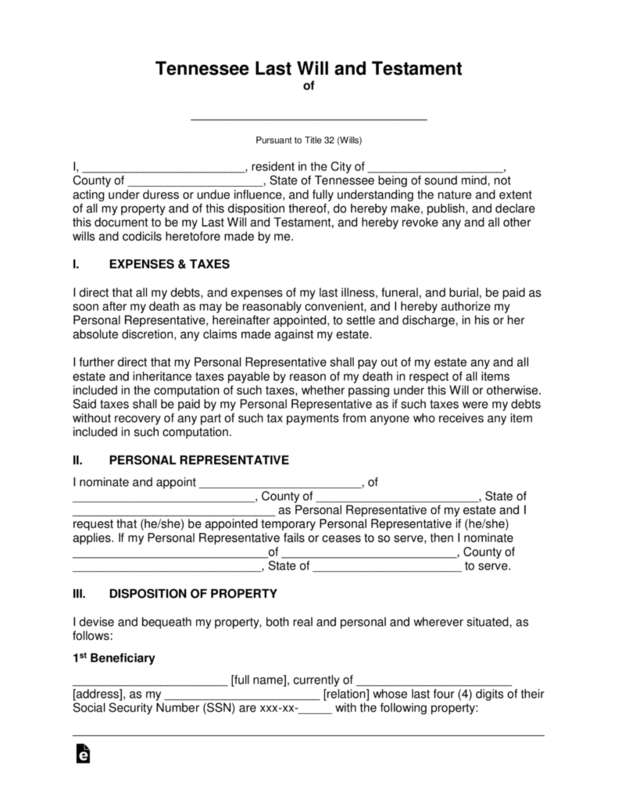 The Tennessee Last Will and Testament is a legal document that allows a testator the opportunity to provide exact instructions with regard to how they wish to have their estate distributed upon the death of the testator. This document usually allows for continued protective provisions for spouses and children, as well, may choose other beneficiaries such as friends, selected institutions for which they were involved among others. Once the document is satisfactorily completed by the testator, it must be provided signature by two witnesses and those signatures must be witnessed by a notary public. The contents of the document are generally read to all beneficiaries by a chosen, trusted executor on behalf of the testator. 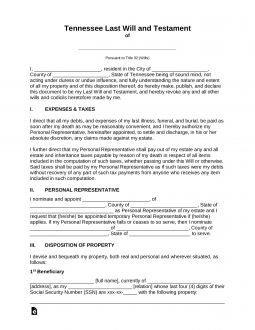 Signing (Section 32-1-104) – The Testator must sign in the presence of Two (2) or more Witnesses. Those witnesses must sign the Will in the presence of the Testator and in the presence of each other. Step 7 – Notary Public- As the testator completes the document, any signature shall be witnessed and acknowledge by a state notary public.